Pol Haveli is a calm oasis in the heart of the mystic "Golden City of the Thar Desert". We a world of traditional hospitality combined with modern comfort and all western standards. Pol Haveli is situated in a quiet and peaceful neighbourhood just beneath the most beautiful sunset point with a magnificent view over the whole city and the fort. The comfortable air conditioned rooms are tastefully decorated in the old haveli style and all have en suite bathrooms. Jaisalmer is famous for embroidery, Rajasthani mirror work, rugs, blankets, antiques and old stone work. Tie-dye and other fabrics are made and color abounds everywhere.We bring you inspired creations by local artisans and encourage you to immerse and have fun with our culture and creativity.Hotel Pol Haveli is among the best hotels in Jaisalmer. Hotel Pol Haveli is considered as a most affordable and budget hotels in Jaisalmer. The style of Hotel Pol Haveli goes back to the traditional stone architecture found in Jaisalmer over the centuries. 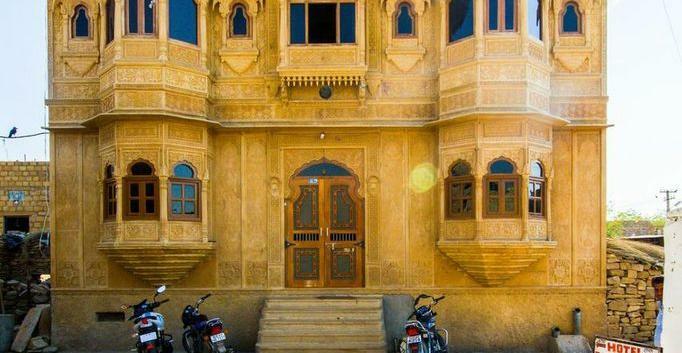 Hotel Pol Haveli gives an impression of an old Haveli of Jaisalmer, which has beautiful carving works on the stone and balconies (Jharokhas). At Hotel Pol Haveli the rooms are furnished in a quiet taste, making use of the silk and cotton materials woven in Rajasthan. Pol Haveli glorious roof terrace covered with Indian floor cushions offers a spectacular view of the town, fort and desert beyond. So, if you are looking for a delightful and affordable vacation, the picturesque city of Jaisalmer is waiting for you. The ventilated rooms and bathrooms make the stay cozy and comfortable. High standards of quality and efficiency have been implemented to enhance the culinary services in the kitchen. The guests can relish great food at the roof top restaurant of the hotel. The chefs are well-trained to offer guests with the finest cuisines and tastes that linger in their memories until they visit the hotel next time.